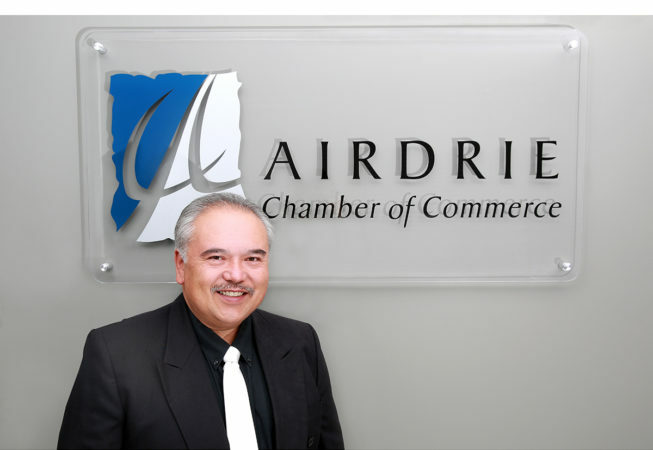 Mr. Al Jones has been named the recipient of the 2016 Airdrie Business Leader Award presented by the Airdrie Chamber of Commerce. This is the seventh year for this award, which is part of the Airdrie Business Awards program. Mr. Jones is well known as a catalyst for drawing people together to fulfill a need, and as an advocate for organizations needing support. He has undertaken volunteer roles in large scale community events, such as the Airdrie Air Show in 2009, 2011 and 2013, where he was the Director of Media and Promotions. He was also the Director for the 2009 Alberta Plus 55 Games, and Chairman for the 2014 Alberta Summer Games. In 2006, he helped raise the profile of Airdrie as a whole, by participating in the CBC Television series, ‘Hockeyville’. Most recently, he’s been an active advocate for the Boys and Girls Club, Airdrie Food Bank, Iron Horse Park, Airdrie Pro Rodeo and Big Brothers Big Sisters. His exceptional service to the community was recognized federally in 2012, being presented with the Queen Elizabeth II Diamond Jubilee Medal by Prime Minister Harper, as well as provincially as one of five recipients of the 2013 Stars of Alberta Award in recognition of volunteerism, presented by Premier Redford. “The nomination we received stated, for those of us that have worked or volunteered with Al, we know that his leadership, experience and passion are a positive asset for both business and community – and the selection committee agreed,” says Lorna Hunt, Executive Director of the Airdrie Chamber of Commerce and member of the selection committee. Al Jones and his business partner, his wife Lois Jones, launched ADvance Distribution in their home in the fall of 1996 as an effective and low cost sales flyer distribution company. Within five-and-a-half years their business expanded by adding a cooperative flyer called Here’s the Scoop, and in 2008 the company expanded to their current location on Kingsview Boulevard. As ADvance Distribution celebrates its 20th year in business, the company owes much of its success to their flagship publication “Here’s the Scoop” which is now celebrating its 15th year of circulation. The award will be presented to Mr. Jones by the Airdrie Chamber of Commerce, the award’s sponsor, at the Airdrie Business Awards Gala on October 20.